To directly address the function of a putative auxin receptor designated ABP1, a reverse genetic approach was taken to identify and characterize ABP1 mutant alleles in Arabidopsis. A homozygous null mutation in ABP1 confers embryo lethality. Null mutant embryos develop normally until the early stages of the globular embryo but are unable to make the transition to a bilaterally symmetrical structure because cells fail to elongate. Cell division was also aberrant both in the suspensor and embryo proper. Antisense suppression of ABP1 in tobacco cells causes slow proliferation and eliminates auxin-induced cell elongation and reduces cell division. 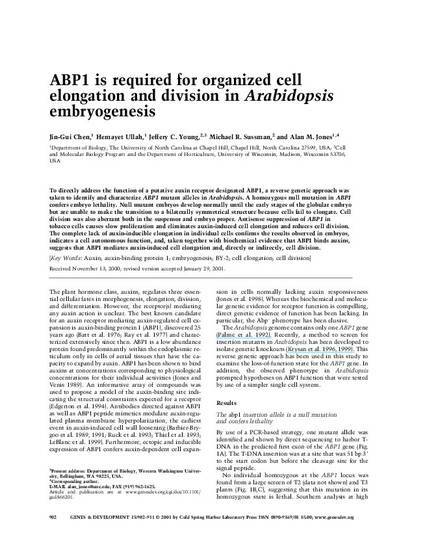 The complete lack of auxin-inducible elongation in individual cells confirms the results observed in embryos, indicates a cell autonomous function, and, taken together with biochemical evidence that ABP1 binds auxins, suggests that ABP1 mediates auxin-induced cell elongation and, directly or indirectly, cell division.